If it’s not already obvious, the second book in the DC Super Hero Girls series focuses on Supergirl. Now, you may think you know Kara Zor-El from the awesome Supergirl TV series or even the older movie (which brings on a sense of nostalgia in me), but you might want to think again. In this book, we get a look at a teen Supergirl, a girl dealing with being not only the new kid in school but the new kid on the planet. Her home planet of Krypton was destroyed, and everything and everyone she knew–including her parents–are gone. That’s a lot for a normal kid to take in. Throw in some brand-new superpowers, and things get much more complicated. Kara Zor-El never really wanted to be a superhero. One minute, she was a happy kid on Krypton, enjoying life with her loving parents. The next minute, she was strapped into a spacecraft and sent off into the great unknown while her parents, her planet, and everything familiar to her was destroyed. She landed on Earth, and two wonderful people, Martha and Jonathan Kent, took her in…much like they had done for another Kryptonian years ago. Now, Kara is facing even more change in her life. Thanks to Earth’s yellow sun, she’s dealing with some pretty intense superpowers–heat vision, super strength, flight, super speed, and much more. Sounds great, right? Unfortunately, Kara is a tad clumsy, and managing her newfound abilities is becoming something of a hazard to those around her. What she needs is a place to learn how to control her powers and how she can use her gifts to help the world around her. That’s where Super Hero High comes in! At Super Hero High, Kara, now known by the name of Supergirl, immediately feels like the odd person out. Everyone here, especially her hero Wonder Woman, seems to already know so much. They don’t trip over their own feet or cause mayhem and destruction with their out-of-control powers. Supergirl is overwhelmed by how much she has to learn, and she often wonders if this place is even right for her. A new friend, Barbara Gordon, and a cookie-wielding librarian, Granny Goodness, try to reassure Supergirl, but her doubts continue to plague her. When a mysterious threat begins to target Super Hero High, the students and staff work together to determine who–or what–is attempting to infiltrate their school. Supergirl wants to help, but what can she do? Sometimes she thinks she just makes things worse. But when the true nature of this threat is revealed, Supergirl–with an assist from Barbara–may be the only one capable of neutralizing this menace for good. Can Supergirl find the confidence she needs to face this danger head-on? And can she finally find her place at Super Hero High? 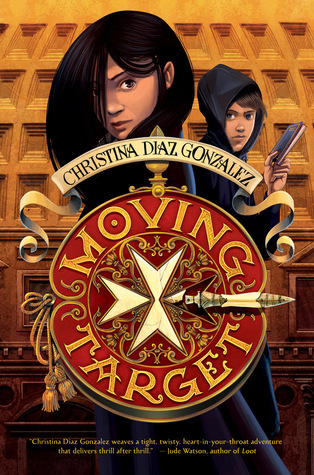 Like Wonder Woman at Super Hero High, this book is an ideal fit for upper elementary and middle grade collections. (I assume that this will also be true of the remainder of the series.) It’s a fun, inviting book that gives readers a glimpse into what life may be like for some of their favorite teen superheroes. It also lets readers know that they’re not alone when they feel out-of-place, lacking in confidence, lonely, or clumsy. Superheroes deal with the same stuff we all do. Spoilers ahead! While I thoroughly enjoyed Supergirl at Super Hero High, I do have one (not totally serious) issue with it. I just have to ask one question. Why did it have to be the librarian? Why, I ask you?! Sure, some in my profession could have super-villain tendencies, but most of us are awesome. I, personally, vow to use my powers for good and never get my students to help me take over the world. I can only hope my fellow librarians feel the same way. If the DC Super Hero Girls series seems like something you or your kids, students, or library patrons would enjoy, have no fear! There are at least two more volumes to love. In addition to Wonder Woman and Supergirl, Batgirl at Super Hero High is already out. (I’ll be reading this one soon.) Book four, Katana at Super Hero High will be released on July 4th. Given how popular these books are, I have high hopes that we’ll see even more books in this wonderful series. 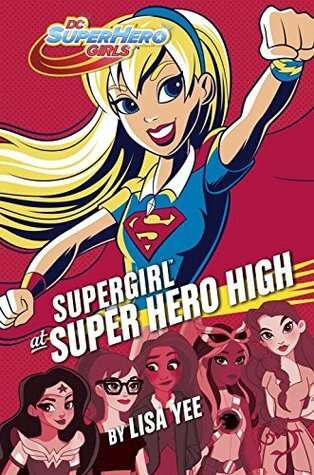 For more information on Supergirl at Super Hero High and the series as a whole, visit author Lisa Yee’s website. Happy reading! Super Hero High is the place to be for teen super heroes…and Wonder Woman wants in. After spending her entire life on Paradise Island (also known as Themyscira) with her mother, Hippolyta, Queen of the Amazons, Wonder Woman finally convinces her mom that she needs to be trained as a proper super hero. Off to Super Hero High she goes! With a positive outlook and a desire to make a difference, Wonder Woman enters the hallowed halls of Super Hero High. Even though some things perplex her (like slang and sarcasm), she’s determined to be a successful student. Almost immediately, she makes a few friends–like Bumblebee, Katana, Hawkgirl, and Harley Quinn (who’s also her roommate)–but it seems she’s also made an enemy or two. Someone keeps leaving notes for her indicating that she’s not wanted at Super Hero High. Who could dislike her so much? With Harley Quinn videoing every move she makes and someone leaving her mean notes, Wonder Woman is feeling the pressure to be the best, especially when she factors in her desire to be on the school’s Super Triathlon team. Can she make a difference when so much is weighing on her? Can she possibly figure out who wants her gone? Join Wonder Woman and many other familiar faces to find out if they’ve got what it takes to be true heroes! I love that Wonder Woman has kind of an Amelia Bedelia vibe in this book. She’s very literal, and it’s fun to see how someone who’s been so removed from slang and popular culture navigates through high school. Speaking of high school, who knew super heroes had it just like the rest of us? Mean girls, struggling to make friends, bullies, striving to make good grades, living up to parents’ expectations. It’s all there, and it’s nice to see that even those with super powers deal with the same stuff we all do. If you’re not familiar with DC comic book characters now, you soon will be. I know a lot of the characters mentioned in this book thanks to the old Adam West Batman TV series, some DC movies (some good, others not so much), and the wonderful programming on the CW. Wonder Woman at Super Hero High introduced me to some I didn’t know much about, and I look forward to reading more adventures of these super (and not-so-super) heroes as teenagers. 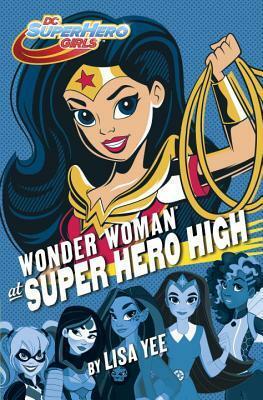 Wonder Woman at Super Hero High is a great fit for elementary and middle school libraries. Considering that many kids (and adults) read DC comics and collect action figures, there’s a ready-made audience just waiting for this book and those like it. The next two books in the DC Super Hero Girls series are Supergirl at Super Hero High and Batgirl at Super Hero High. Both are already out. The fourth book, Katana at Super Hero High should be out on July 4th of this year. If you’d like more information on Wonder Woman at Super Hero High and the series as a whole, visit author Lisa Yee’s website. Most people who know me know that I have a certain fondness for Sherlock Holmes. Actually, that’s probably a bit of an understatement. It’s more like I’m obsessed, especially with the BBC’s Sherlock. Just this morning, I was wrapped up in my 221B Baker Street blanket, leaning on my Sherlock Holmes book pillow, and drinking coffee out of my “I am Sherlocked” mug. Anyhoo, I tell you all of that to preface my latest read, A Study in Charlotte by Brittany Cavallaro. If you’re a fellow Sherlockian, you’ve already picked up on the wordplay in the title. (It’s a play on A Study in Scarlet, the story that first introduced readers to Sherlock Holmes and John Watson.) Based on the title alone, I knew I wanted to read this book. When I read the synopsis and discovered it was about the teenage descendants of Holmes and Watson–who were real-life people in this world–I was hooked. None of that changed as I began reading. In fact, this enthralling novel made me even more enamored of all things Holmes (and Watson, of course). Jamie Watson doesn’t feel like he belongs at his new school, Sherringford, which is way too close to his absentee father. He misses his home in London, but he may have just found a piece of London–one tied to his family’s infamous past–right here in Connecticut. There’s another Londoner at Sherringford, but a friendship with this girl is sure to come with all sorts of difficulties. You see, this girl is Charlotte Holmes, great-great-great-granddaughter of the one and only Sherlock Holmes…and Jamie is a descendant of Dr. John Watson. Jamie would like to strike up a friendship with Charlotte, but it doesn’t seem very likely at first. Charlotte is as cool, temperamental, and borderline antisocial as her last name would suggest, and she seems to look at Jamie with something akin to disdain. Circumstances, however, are about to drive these two crazy kids together, and they will form a partnership that rivals that of their ancestors. When a Sherringford student is killed–and all signs point to either Jamie or Charlotte being the culprit–they must team up to solve this mystery. Who could possibly want to frame them for murder, and what does all of this have to do with their family histories? As Charlotte and Jamie try to work together, Jamie quickly learns that Charlotte is not exactly easy to be around. She may be a genius, but she’s battling some serious demons and hiding secrets that could get both of them killed. How can he convince her that she can trust him? Does Jamie really trust her? At any rate, Holmes and Watson are on the case at Sherringford, and nothing will be the same for either of them when the truth is finally revealed. Charlotte Holmes is, in my opinion, an absolutely perfect descendant of Sherlock Holmes. She views sentiment as an inconvenience (in most cases), she’s unbelievably brilliant, and she has no time for small talk or trivial matters. She’s endured truly horrific things in her life, and she hasn’t always handled them well. She’s got very real problems–her drug habit being chief among them. That being said, Jamie Watson is, like John with Sherlock, Charlotte’s ideal counterpart. He looks out for her when she forgets to care for her own well-being. He reminds her of her humanity…and that of those around her. He balances her, and these two are much stronger together than they are apart. That’s something I hope we’ll see lots more of in future books. I predict that there will be a bit of a romance between the two eventually, and, while I could do without that addition to their relationship, it’s sure to be fascinating to see how things play out. 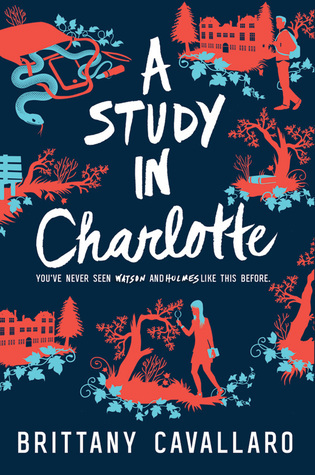 A Study in Charlotte is the first book in a planned trilogy. The second book, The Last of August, will be out on February 14th, 2017. Based on the events of book one at the title of book two, I’m sure this story will be a nail-biter. I can hardly wait. For more information on A Study in Charlotte and Brittany Cavallaro, visit the author’s website. You can also follow her on Twitter, Tumblr, and Goodreads. And now, my friends, I think it may be time for a Sherlock marathon. Who’s with me? If you’ve read Fangirl by Rainbow Rowell, you’ve already been introduced to the characters of Simon Snow and Baz Grimm-Pitch. These two characters are the subjects of Cath’s fanfiction in Fangirl. In Carry On, Rowell graciously gives readers the story Cath was working on. Now, it’s not totally necessary for you to read Fangirl to follow what’s happening in Carry On, but I do think it helps. Simon is starting his final year at the Watford School for Magicks, and he’s fairly certain that he’ll have to battle the Insidious Humdrum, the strange figure who’s creating holes in the magical world, at some point this year. (Simon has no clue how he’s supposed to win against this guy.) He’s also worried that he and Baz are probably going to end up killing each other. That is, if Baz ever shows up. When the new school term begins, Baz is nowhere to be found, and Simon becomes obsessed with figuring out what’s happened. There’s simply no way Baz would voluntarily miss his final year at Watford…or any chance to torture Simon. Does his disappearance have something to do with the Humdrum or the increasing negative feelings about the Mage? Could it be related to Baz being a vampire (which he has never actually admitted to Simon)? Or could something more be going on? Whatever’s happening, Simon needs to know where Baz is…and what he’s up to. Soon, though, Simon has one less thing to worry about. Baz returns to Watford. Why was he gone? Well, that’s sort of complicated. Eventually, Simon and Baz realize that they’ll have to form a truce and join forces to discover what’s really going on in the World of Mages…with the Mage, the Humdrum, all of it. Can these two work together without killing each other? Will Baz reveal his feelings for Simon? How does Simon truly feel about Baz? Is there hope for the future when the World of Mages is in so much turmoil? Only one thing is certain: It’s going to be a very interesting year at Watford. Those who’ve read Fangirl (or any of this post) likely already know that Carry On features a developing relationship between Simon and Baz. This is commonly known as slash fic, and is very popular in fanfiction writing. If you ever wanted Harry Potter to end up with Draco Malfoy instead of Ginny Weasley, definitely give Carry On a try. It’s a very sweet love story, but there’s enough danger, magic, drama, and even humor to satisfy all readers (even those who don’t particularly like slash fiction). As I wrap this post up, I realize that I haven’t begun to express just how wonderful Carry On really is. I don’t know if I can. Read it for yourself. Hopefully, you’ll love it as much as I do. 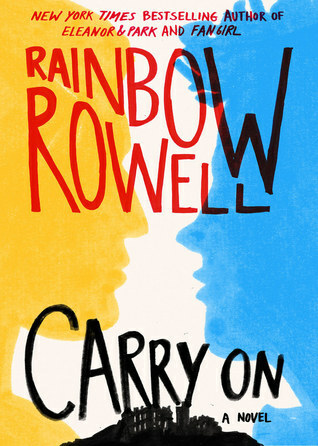 If you’d like more information on Carry On and other books by the absolutely fabulous Rainbow Rowell, check out the author’s website or connect with her on Facebook, Twitter, Tumblr, or Instagram. You may also want to check out the video below. It features Rainbow Rowell herself talking about Carry On at Book Expo America. Isla Martin has been in love with Josh Wasserstein since the start of their freshman year at the School of America in Paris. Fast forward to senior year, and it seems that Isla may finally have a chance at being with the guy who’s always seemed out of her reach. After a rather odd encounter in Manhattan over the summer, the two finally reunite at school, but Isla can’t get over her nervousness around Josh, and it looks like Josh is trying to keep his distance. Trying…but not succeeding. Isla and Josh are growing closer, and when Isla clears up a misunderstanding that was keeping Josh away, they’re finally able to start the relationship that both of them so desperately want. Isla and Josh become nearly inseparable, and they want to spend every spare minute together. Sometimes it’s as simple as being in the same room–Josh sketching or working on his graphic novel, Isla studying or reading–but being together is what’s important. They explore their favorite spots in Paris. They learn all the important little things about each other. And during one memorable, romantic weekend, Isla and Josh break all the rules and journey to Barcelona to take in a few sites. It’s this weekend, though, that ultimately tests how strong their love really is. When Isla and Josh return to Paris, they realize that their impulsive actions have devastating consequences. Josh is taken away from school and Isla, and this heart-breaking separation takes its toll on the couple’s burgeoning relationship. The more time they spend apart, the more Isla begins to doubt if Josh’s feelings for her are real. She knows she loves him, but what does he really see in her? Why would he want to be with someone who doesn’t know what she wants to do with her life? Is she just a placeholder for his ex-girlfriend and all of his friends that have moved on? Isla just doesn’t know, and her doubts soon lead to an epic confrontation that may destroy any hope of a future with Josh. I love this book so hard. I have zero complaints, and people who know me realize how rare that is. I think every girl (or guy) who reads this will absolutely fall in love with Josh. Many readers will likely identify with Isla and her deep-seated–and often unfounded–insecurities. Everyone will root for Isla and Josh to make it. Adult readers will probably want to go back and relive their teen years in the hopes of finding–or reliving–a love like the one we see between Isla and Josh. 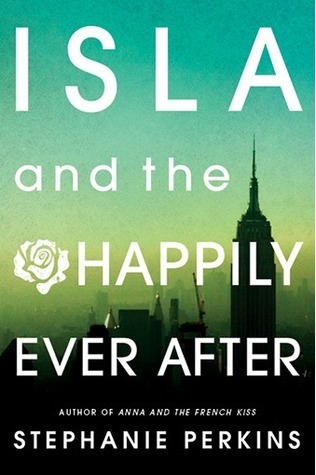 After reading Anna, Lola, and Isla, I have to say that I will read anything that Stephanie Perkins cares to write. (I already follow her blog and Twitter, so I think I’m good to go there.) This lady is a master of YA romance, and I recommend her to every teen and adult reader who likes a good love story. I am eagerly anticipating her next book, and I can’t wait to see what she contributes to the upcoming anthology, My True Love Gave to Me: Twelve Holiday Stories. If you’d like to learn more about the fabulous Stephanie Perkins and her equally fabulous books, check out her website, Twitter, or Tumblr. Spoilers! Don’t read this if you haven’t kept up with Ally Carter’s Gallagher Girls series. I just finished the sixth and final book in the series, and I’ll be talking about this book and the series as a whole in just a bit. Check out my posts on the first five books in the series below. Now…onward to United We Spy! For those still with me, I guess you’ve figured out that I finally finished reading United We Spy, the last book in Ally Carter’s thrilling Gallagher Girls series. This final installment was, perhaps, the most action-packed of the entire series, and the fascinating characters I’ve come to know are putting everything they ever learned at the Gallagher Academy to the test. Their ultimate mission? Save the world. No biggie, right? Cammie Morgan is starting her last semester at the Gallagher Academy for Exceptional Young Women. She should be worrying about senior pictures, college admissions, and final exams…but those things don’t matter all that much when the fate of the entire world could be in your hands. Cammie and her friends are facing a plot to engage the world in an epic war…and it’s up to them to stop it. Cammie, Bex, Liz, Macey, and Zach may have been training for years to be spies, but their training may not have prepared them for everything that’s about to unfold. They’ll have to brave the harshest of elements, breaking into a super-maximum security prison, and heavily-armed enemies to prevent all-out war. And when it’s revealed that the enemy’s plans were hatched from the mind of a Gallagher Girl–someone very close to Cammie–things become even more intense. These Gallagher Girls (and Guy) can’t trust or depend on anyone but themselves right now…but will their own efforts be enough to save the world? Can they put everything they’ve learned at the Gallagher Academy to use before the enemy, the dreaded Circle of Cavan, succeeds in its mission to start World War Three? What secrets will be revealed in the process, and will everyone make it out of this battle alive? Things are coming to a head at the Gallagher Academy, and everything is about to change. Will Cammie and company succeed in preventing war, and if they do…what then? What does the future hold for Cammie and her friends? One thing is certain–Cammie has to get out of this fight alive (and relatively well) before she can even think about her future…whatever it may be. United We Spy is an action-packed read that kept me hooked from the first page. It built on everything from the previous books, and it showed just how much a group of strong young women is capable of accomplishing. (No, I’m not discounting the contributions of the guys in the series. I’m just saying that the series as a whole focuses on the ladies, their abilities, and their tremendous strength in adverse situations.) I hope this series will inspire more young women to be confident in their own abilities–whether it’s being a spy, a musician, a public speaker, a writer, whatever. I thoroughly enjoyed the way things played out in this book, and I thought the conclusion–oddly reminiscent of the final battle of Hogwarts in Harry Potter and the Deathly Hallows–was particularly fitting. I hate to say goodbye to the characters I’ve come to know and love in these six books, but I take comfort in the fact that I can revisit them anytime I want. If you’d like more information on this series and other books by Ally Carter, go to http://allycarter.com/. You may also enjoy the United We Spy book trailer below. It doesn’t give much of anything away, but it does provide just a glimpse into what it means to be a Gallagher Girl. I hope you enjoy the Gallagher Girls series as much as I have. It’s been wild! Spoilers! Read Maureen Johnson’s The Name of the Star, the first book in her Shades of London series, before continuing. I just finished the second book in the series, The Madness Underneath, and you really need to experience the first book before diving into the second. This sequel is definitely not a stand-alone novel. You’ve been warned! A little over a year and a half ago, I read The Name of the Star (which is now on the nominee list for this year’s South Carolina Young Adult Book Award). I picked this book up for two reasons. 1. The author, Maureen Johnson, is one of the funniest people on the planet. (If you don’t already follow her on Twitter, you should.) 2. Jack the Ripper. I’ve always been kind of morbidly fascinated by stories of the Ripper, and I figured this one–with its new supernatural twist–would intrigue me. As usual, I was right. I absolutely adored The Name of the Star (one of my top 10 books of 2011), so I’m not sure why it took me so long to pick up the sequel. (It was released in October 2012.) At any rate, I made time for it this week, and it didn’t take long to get right back into the world created in this series. With the help of some high-ranking government officials, Rory is allowed to return to Wexford. She’s behind in all of her classes, and she has a bit of trouble adjusting to school after so much time away, but Rory is back with friends…including the Shades of London, a top secret “police force” capable of seeing and interacting with ghosts. And the Shades–Stephen, Callum, and Boo–need Rory. Now that their all-important termini (ghost-eliminators) are gone, Rory is the only being that can send ghosts on. (On to where, I have no idea.) A simple touch makes ghosts go bye-bye. So, in addition to worrying about grades, friends, boys, and the warped psyche that comes with nearly being murdered, Rory must also deal with being a human terminus, a weapon against ghosts with a grudge. And boy, do some of the ghosts in London carry grudges. But they’re not the only beings up to no good. It seems that something–or someone–even more disturbing may be at work, and Rory finds herself right in the middle of yet another mess. Her longing to get away from her problems and find a place to belong may have landed her into a predicament that even her quick wit can’t get out of. What has Rory gotten herself into this time, and will she be able to find a way out…before she or someone she cares about pays the price? 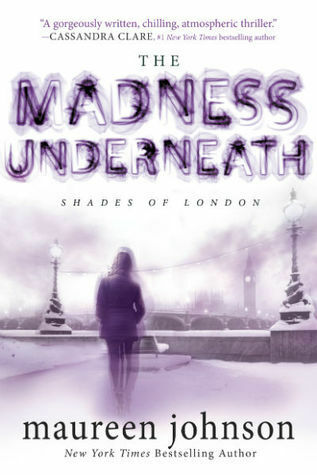 Learn what madness lurks underneath the streets of London–and in the hearts and minds of people–when you read The Madness Underneath, the second book in Maureen Johnson’s Shades of London series. I guess that’s all for now. I’ll leave you with a book trailer for The Madness Underneath from Penguin Young Readers. It’s creepy, but it doesn’t give away much of anything about the book. It does a good job of setting the mood for a good supernatural mystery though. Enjoy!